Turn up your volume, enjoy some music. for more info and more photos! Here is an update on my weight loss. 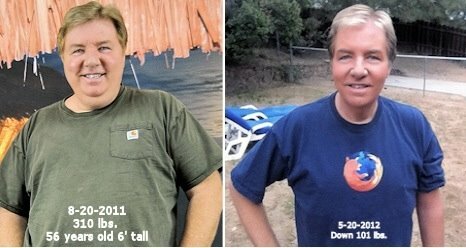 I have lost 110 lbs. and plan to lose more in the next few months. I have gone a mostly raw plant-based lifestyle and love it! Tons of new super tasty food to enjoy! I lift weights 3 days a week and walk a mile a day 5 days a week. Or I just go backpacking in the high sierras! My cholesterol went from 366 to super healthy 112. Many other health problems all gone. No more meds. I feel way better and have tons of energy all day. It is so basic and simple!! I'll never go back to animal products!! Check out Rawligious.com my new diet, weight loss and health page! See my schedule and come meet me! I will give you an awesome deal on a Blendtec Blender! See my new "Tonight Show" type video studio at my home here. I will be taping a new talk show in 1080P HD for my "YouTube" channel soon. We will be talking politics and much more! If anyone has ideas or want to be a guest to talk politics and much more, let me know. Thanks! View my latest "wall photos" then click on each photo to see comments. I carved redwood signs for 30 years and traveled fairs. I caused a lot of people to do the same thing. There are now many sign carvers using basically the same system. In 1996, I started SierraNet, the first local number Internet Service Provider in Oakhurst, CA. I taught computer classes at Yosemite High School and started SierraStar.com as a free service for the Sierra Star that same year. A few years later, I sold my ISP business to Sierra Telephone. Since the sale, I traveled a lot. In 2007, Scott Cockerham and I opened Oakhurst Computers in Oakhurst. I sold my half of of that business in 2010 and now travel and run my websites. Visit my: facebook.com/corkystanton for more info and more photos! Wow, I made Citizen of the week! Streaming video for modem connections HERE!